This Balsamic Rosemary Chicken Recipe is sooooooo easy to make and tastes like a million bucks. Perfect for a busy weeknight meal! It goes perfectly over rice or roasted vegetables. The soy balsamic sauce adds such delicious flavor to the chicken breasts and helps to keep the moist and juicy. And the rosemary gives such a nice and unexpected boost of savor and helps highlight all of the other ingredients. My whole family loved this…even the kids, which is HUGE. I’m definitely planning on using this Weight Watchers chicken recipe for summer dinner parties, as it’s truly a crowd-pleaser and yet still an amazingly easy meal to prepare. And if you aren’t concerned with Points or calories/fat, it works really well with chicken thighs too! Incredibly juicy and flavorful, this low calorie chicken recipe is a real crowd pleaser. It’s very quick and easy to prepare, but packs a big punch on flavor. Makes a great weeknight Weight Watchers dinner recipe. Spray a 2-3 quart shallow baking dish with an olive oil mister or non-fat cooking spray. 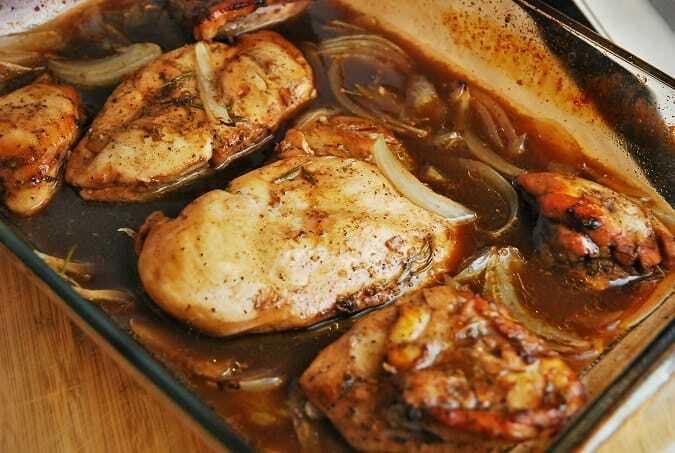 Place chicken in baking dish and cover with shallots. In a medium sized bowl, whisk together the soy sauce, vinegar, honey, garlic, pepper, and rosemary. Pour over chicken and shallots. Cover baking with aluminum foil and roast in oven for about 20 minutes or until chicken is cooked through. Then, remove aluminum foil and place chicken back in oven for about 10 minutes to brown a bit. Let rest for about 5-10 minutes before serving. I made this tonight and it was delicious! I substituted a regular onion for shallots, and it seemed to work just fine. Will definitely be adding this to the regular recipe rotation! This was great – the chicken turned out really moist. Served with roasted broccoli and squash and some blue cheese polenta. Just wanted to let you know, I made this for a Graduation party today for 50+ people and it was a HIT! So many compliments! Thanks for making me look good and giving me an awesome go-to chicken recipe! This looks wonderful. Is there a brand of balsamic vinegar that you would recommend? What about olive oil? I’m new to cooking with these ingredients and have heard to use a good quality of each but have no idea what brands. Thanks! For olive oil, I use the Costco brand (Kirkland) Organic Extra Virgin Olive Oil. And for balsamic vinegar, I use Napa Valley Naturals Organic Balsamic Vinegar. I try to use as much organic as possible…it’s a much cleaner taste, and better for you too.